Japanese breadcrumbs that are made from the heart of the bread, not the crust. 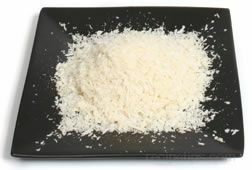 This type of breadcrumb has a coarse texture that resembles flakes in consistency, which adds more of a crunch to breaded foods such as fish, pork, casserole toppings, and a variety of fried foods. Due to the flaked crumb, the texture is often considered to be more tender and lighter, yet crunchier for longer than a typical breadcrumb coating. Panko is available in most Asian food stores.